The Visitor and Resident project is yielding important data about behaviours in digital environments and the real world. Understanding behaviours around technologies is not new and work around digital literacy is an ongoing theme across education. But digital literacy is only the start of the process and many people are no longer identifying skill sets that they have developed as being a digital literacy precisely because they have become embedded in practice. These include the use of word processers or presentation packages; this is part of the evidence for thinking about organisations in a post digital way, where many technologies have disappeared into use. 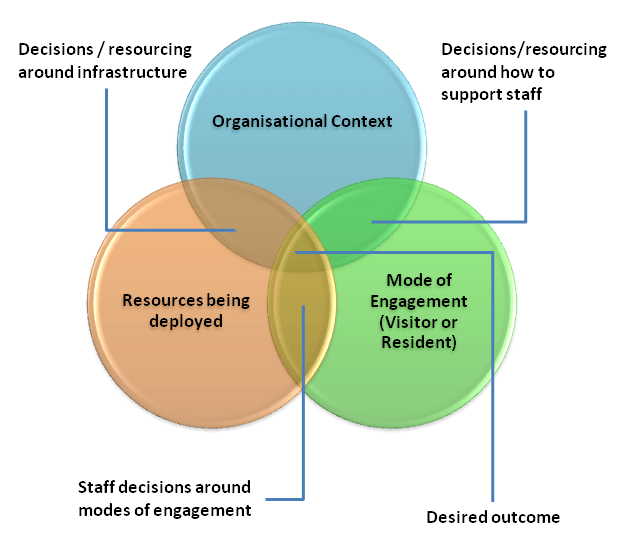 Using the Visitor – Resident Model to understand these staff behaviours, perceptions and motivations can help identify which technologies or artefacts can be deployed most effectively to support different types of staff, and where a technology needs to be deployed ubiquitously across an organisation it can be used to develop different types of supporting materials and processes. This may include determining how an organisation reacts, what resources, such as funding or staff development / time is required and whether an artefact is more suited to a ‘resident’ or ‘visitor’ approach allowing intelligent decision making. What do we mean by Visitors and Residents? Residents may have a significant online presence and usage; high level of collaborative or communal activity online; contributions to the online environment in the form of uploading materials, photos, videos; high dependence on a mobile device (smart phone, laptop, etc.).. Visitors may have functional use of technology, often linked to formal need (such as use of software for specific coursework, or organising meetings through email contact); less visible/more passive online presence, more likely to favour face- to- face interactions (even as they use the internet to organize/schedule those interactions. However, it should be remembered that these labels are not absolutes, and are more of a continuum along a visitor resident axis. Bisecting that axis may also be a personal – professional continuum. Resulting in individuals who may only be resident or visitor, personally or professionally. As a reflective tool, an individual can gain insights into their behaviours, if that data is then available to staff responsible for deploying technology it can be a valuable aid in the decision making process. A draft model for deployment using that data is shown below. In this model it is possible to identify a technology or artefact that is required and then base decisions around the resources needed to deploy it in terms of infrastructure, supporting staff based on their online use (visitor or resident) and on whether or not the artefact itself is more suited to either resident or visitor approach. An example may be a collaborative experimental tool requiring users to have both knowledge of the tool, and also supporting tools such as collaborative writing tools, wikis for displaying results and engagement in forums for discussion. Somebody comfortable with a resident modes of engagement may feel they can commit very easily to that level of multi tasking and synthesis, however, a resident may need extra support in setting up tools, such as email alerts, RSS and communications tools or simply in finding the best sources of information. which could be used to aid and simplify the tools use. This is a great post Lawrie. I think your analysis is really interesting, but I wonder whether the ‘user’ themselves has to be in this too? Is the Venn diagram slightly misrepresenting the relationship V&R would have to the other factors? I could see the V&R model more as an ‘overlay’ or framework that would include a third category which would be the user themselves. 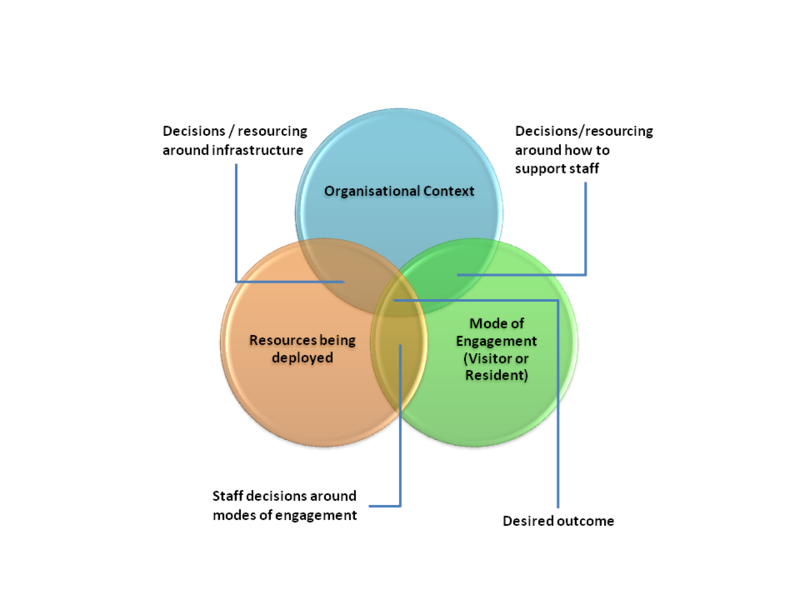 So maybe the three circles (user, resource, organisational context) would be within the broader V&R ‘framework’ and therefore enable an understanding of the relationships between the three circles, without determining those relationships. I think this is a really useful approach – and clearly demonstrates the potential for V&R to have an impact on institutional concerns and resources.